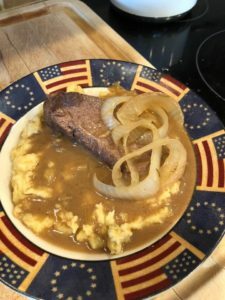 Today’s new recipe is Slow Cooker Elk Roast and gravy over mashed potatoes. I sliced the potatoes and cooked them with the elk, then pulled them out and mashed them. Elk gravy over all of it. Served with green beans and my little guy loves it! Put a liner in your large slow cooker. In a large skillet, melt butter, salt and pepper your roast on both sides, then place your roast in the pan and sear on both sides. Place the seared roast in the crockpot. Sprinkle garlic powder, rosemary, and ground black pepper over the roast, then top with sliced onion. In a small bowl, mix the dry onion soup, cream of mushroom soup, and beef broth, mix well, then pour over the roast in the slow cooker. Pour the wine in your skillet and de-glaze it, then pour that mixture in the crockpot as well. Slice the potatoes and put them in the liquid around the roast. Cook on low for 6-hours. When done, use tongs and pull the potatoes out and place in a large bowl, add additional milk and butter as needed to mash the potatoes. Slice roast in 1/2″ wide slices. Place potatoes on the plate, then top with the roast, some onions and cover with the gravy from the slow cooker. Enjoy! Now get out hunting and harvest some upland fare so you can enjoy this meal! No need to make anything else to go with it.